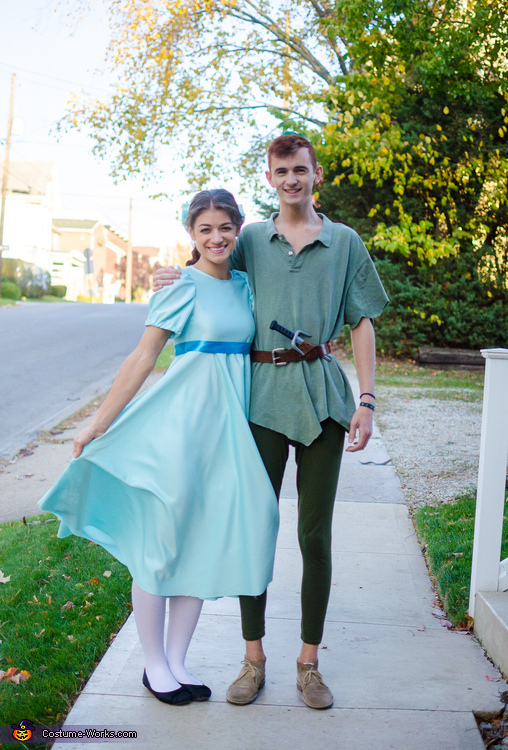 My costume is the Wendy Darling one. I made the dress from scratch using sewing patterns from the internet. The site was called "The Little Studio". I purchased the fabric from Jo Ann Fabrics and went to work! Before this dress, I had made a ukulele case, but nothing else. I bought the bow and already had the tights and the shoes. To get my curls, I used the old fashion technique of rage curls. I wrapped my hair for the day and went to all my classes and took them out just before we had to leave. I got inspiration from both the cartoon and from looking at the Wendy Darlings in Disney Parks. My make up was inspired by the make up wore by the Wendy in the parks: brown blush, pink lipstick, and brown eye shadow. I naturally have brown eyes so I wore grey contacts to make my eyes look blue like Wendy's. The dress was $30 for the ribbon, fabric, and zipper. The bow was $6 from Claire's. I had gotten the contacts as a free sample and the shoes and tights I already had. For Peter, we found the leggings at Walmart in the little girl's section. The top is from Good Will. I measured the triangles and cut. For the hat, we used felt and I sewed the hat together and stuck the feather in a little hole on the side of the hat. My boyfriend usually has curly hair, but he willingly, though not wanting, let me straighten it and color it with color spray. His shoes were borrowed from a friend. Overall cost, the leggings $4, shirt $4, hat $3, and the color spray was free when I bought my bow at Claire's. For this costume we looked at the cartoon for the inspiration.